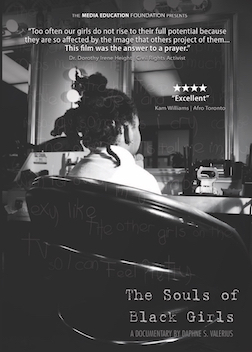 The Souls of Black Girls has screened at hundreds of universities and organizations around the country, and earned Valerius the Rising Female Filmmaker Award at the Harlem Int'l Film Festival. In 2015, it aired on ASPIRE TV in association with the White House Initiative on Educational Excellence for African Americans, earning Valerius a trip to the White House as an invited guest of First Lady Michelle Obama. Daphne Valerius is available for workshops and speaking engagements. Please click here for more information on hosting a private screening of the film. Meet Daphne Valerius, one to watch as the era of women of color redefining the landscape of media images –in front and behind the camera—begins to unfold. A native of Rhode Island by way of Brooklyn, New York —Host, Producer and Entrepreneur Daphne Valerius has journeyed into the successful pursuit of redefining the landscape of media images with an array of talent that navigates her both in front and behind the camera. Valerius’ passion for the media industry began during her undergraduate studies at St. John’s University. She went on to complete her Masters in Broadcast Journalism at Emerson College, where she received the esteemed Associated Press Award for Public Affairs and produced her award-winning documentary, The Souls of Black Girls. Among other achievements, the success of The Souls of Black Girls has garnered Valerius the support of the late Dr. Dorothy Height, the Mira Nair Award for Rising Female Filmmaker from the Harlem Int'l Film Festival and being named among the Best Black Documentary Directors of 2008. Notably, Valerius was featured as a panelist of Procter & Gamble's 2009 national "My Black is Beautiful" Tour where her documentary, The Souls of Black Girls was used as a centerpiece for discussion. Most recently Valerius was an invited guest of First Lady Michelle Obama to the White House as a result of her work. With profound commitment to her craft, Valerius sets out to influence, inspire, uplift and serve women and girls through positive, educational television, film and fashion projects. A member of Alpha Kappa Alpha Sorority, Inc., Valerius remains an active community leader while traveling throughout the country to promote the messages conveyed in her film. Her television production credits include work for networks such as ABC, FOX and BET. She is currently working on her upcoming television pilot called The Block and the sequel to her documentary, The Souls of Black Girls, Too. Daphne Valerius is available for workshops and speaking engagements. Please contact assistant@soulsofblackgirls.com for more information. "Too often our girls do not rise to their full potential because they are so affected by the image that others project of them…This film was an answer to an prayer." "As Director of the St. John's University Gaining Early Awareness and Readiness for Undergraduate Programs (GEAR UP), I've used the Souls of Black Girls documentary to open the dialogue of self-love and acceptance with my young women every time the opportunity arised. We must continue to create the platform for our young men and women to discuss self-love. I strongly recommend the use of Souls of Black Girls as a tool for open discussion. Most importantly, it creates a "safe space" for young women to share personal struggles with self and what society constitutes as beautiful."